"I was tired of eating baked potatoes the old fashioned way with gobs of butter, so I created this simple recipe to put a little twist on them. My family and friends love them and I hope you do too." Place the potatoes into a large pot with water to cover. Bring to a boil and cook over medium-high heat for about 10 minutes, or until tender. Preheat the grill to medium-high heat. Drain potatoes and toss with olive oil, black pepper, rosemary and salt to taste. Place the potatoes skin-side down over indirect heat on the grill and reserve liquid. Grill for about 15 minutes. Remove potatoes to a serving plate and sprinkle with the reserved olive oil mixture. Very disappointed. All I could taste was the oil. I made mashed. I skipped the boiling process and just microwaved for a few minutes. Then quartered and let marinate in the fridge until I was ready for them. Great flavor off the grill. 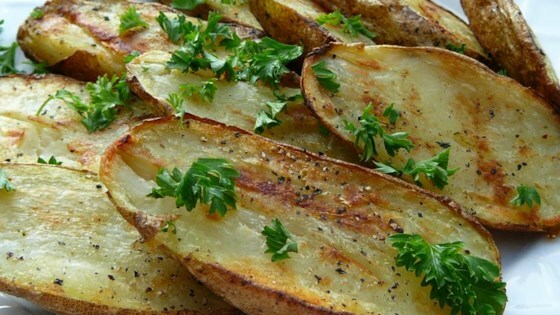 There is not enough "marinade" for these potatoes as listed in the recipes, although it tastes delicious after cooking. I would suggest doubling the recipe.